I saw a good reddit thread saying Ned Stark might not be carrying a huge sword as it might attract attention. Do we know if he was definitely using Ice? Alternatively, do we have any reason not to believe it wasn't Ice? Both in TV series and books answers are appreciated. they're quite obviously not the same. In the book A Game of Thrones the great-sword known as Ice is not mentioned in the encounter between Jaime and Ned. I have quoted select sentences from the full passage that details the fight. "No!" Ned Stark screamed, clawing for his sword. Jaime was already cantering off down the street as he heard Wyl shout. Ned galloped to him, bringing his longsword down on Tregar's helm. Ned's sword is only mentioned twice and is never called "Ice" or even a "great-sword". Ice is always called by name or as a "great-sword", if not both in the books. Ned was also mounted on horse in the books. It would be very difficult to wield a two-handed great-sword while mounted, so even if Ned had Ice on his person at the time of the fight, he would have wanted to use something more suitable for the situation. The only time we see Ice used is for executions. Remember Valyrian steel swords are very rare and treasured. Not even the Lannisters have enough gold to make a lesser house forget their pride and honor to sell one. 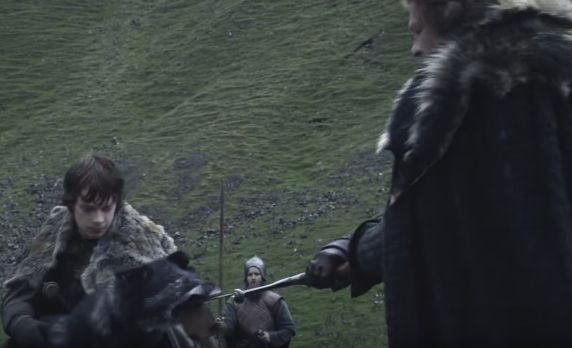 No, Ned was not using Ice during his fight with Jaime, he was using a normal arming sword. In the TV series Game of Thrones, Ice, the Valyrian steel sword of Eddard Stark, is portrayed as a claymore-sized ceremonial blade (greatsword), which is so large that it requires Theon to hold the scabbard while he unsheathes it. 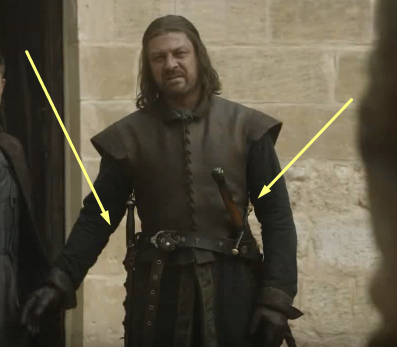 The sword Ned Stark uses in his fight against Jaime Lannister (in Season 1, Episode 5) is a typical arming sword (he carries two on his waist in the scene before drawing one of them). This was addressed out of universe by GRRM during a panel Q&A and is part of the So Spake Martin archives at Westeros.org. He states plainly that no, Ice is a ceremonial sword, not a battle sword. Not the answer you're looking for? Browse other questions tagged game-of-thrones a-song-of-ice-and-fire weapon or ask your own question. Is there any proof that Jaime Lannister is actually a good swordsman? Was Eddard Stark as good a/better swordsman as/than Jaime Lannister? Will Jaime Lannister get his hand back? Was Ned Stark actually a good swordsman? How did Jaime Lannister know his new Valyrian steel sword was freshly forged?